What You Need To Know About The Coming Showdown Between Trump And Mueller Following months on a collision course, the White House and the special counsel's office are on track for a standoff that could take Washington, D.C., into terra incognita. Former FBI Director Robert Mueller leaves following a meeting with members of the Senate Judiciary Committee at the U.S. Capitol last year. If Trump and the White House stick by their decision not to give Mueller an interview, the special counsel has a choice of his own: Will he accept the arguments made by Trump's attorneys that he already knows everything Trump could tell him and stand down? Or will Mueller choose a path seldom traveled and issue a subpoena to try to compel Trump to sit for an interview? Here's what you need to know about how we got here — and what might come next. The meeting followed an offer of help to Donald Trump Jr. from the Russian government via a series of intermediaries. When the Times was on the verge of reporting on the meeting, Trump Jr. initially said — in the statement written by Trump senior — that the meeting was mostly about "adoptions." Later, Trump Jr. released the emails in which the session had been organized. Last month, it became clear that the Russians used the meeting to give Trump aides a political opposition research tip, although not one, according to the accounts of the participants, the Russians had initially promised about Hillary Clinton. For two reasons: First, Trump's direct involvement is important if Mueller is building a case that the president has been engaged in a pattern of deception or other behavior that amounts to obstruction of justice. Prosecutors might group this together with other examples since Inauguration Day. And second, it raises questions about how closely Trump has been involved all along with the contacts between people in his campaign and Russian operatives. Trump has said he wasn't aware that Russia was attacking the presidential election in 2016 or that his aides were interacting with Russians at that time. Trump himself has been described as not a target of the FBI's investigation. But the Senate Judiciary Committee revealed last month that, as Trump Jr. was arranging the meeting at which he hosted his Russian guests, he made two phone calls to a blocked number. Trump Jr. told senators he didn't remember with whom he spoke. Trump senior is known to have used a blocked number. If Mueller's investigators established that Trump Jr. did, in fact, phone his father, that could suggest that Trump senior knew at the time of the meeting at least that it was taking place. That raises questions about how much else Trump knew about the overtures the Russian government had been making to his campaign since spring 2016. If Trump did know about what was happening — even if neither he nor his aides actually conspired with the ongoing Russian active measures — that might have given him an incentive to frustrate efforts by FBI investigators to find out about what his campaign aides had done or what he knew. Mueller's investigators want to ask about all this. Trump's lawyers have been resisting confidentially and they've also been litigating their case in the press. Trump's legal team argues not only that Trump did not break the law that prohibits obstructing justice, but that, in short, he cannot commit that crime: His actions as president all have been within the authority afforded him by the Constitution, the lawyers say. If he asked then-FBI Director James Comey to lay off the case of former national security adviser Michael Flynn, that was within Trump's power, they argue, because he can end any investigation for any reason. And the Constitution also gives Trump the privilege to fire Comey or nearly anyone else under him in the executive branch, the president's legal team says, for any reason. President Trump waves to visitors as he walks across the South Lawn before boarding Marine One and departing the White House on Friday. And Trump not only couldn't have obstructed justice, according to this line of argument, the president argued on Monday that even if he had broken any law, he has the power to pardon himself. 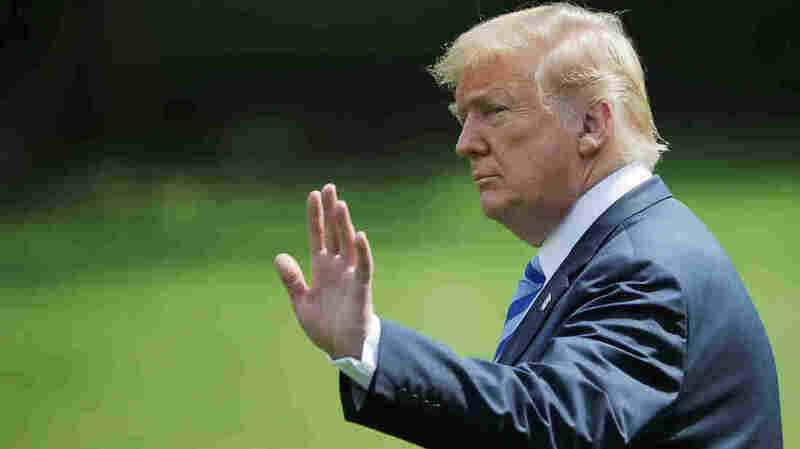 Trump, in claiming that privilege, stopped short of saying he might use it, and his attorney, Rudy Giuliani, said separately that the president recognized that pardoning himself might bring on a severe political backlash. All the same, the manifold claims about executive power appear to add up to a message to the special counsel: Trump has not and cannot do anything wrong in this context and even if he had, he has the authority to make all this go away. The special counsel's office simply could drop its request for an interview with Trump. Mueller then could do whatever other work he believes he has set out for him. No one knows whether Mueller intends to file charges against other people in the Russia case — for example, to indict the Russian cyber-operatives who stole emails from the Democratic National Committee and other political targets in 2016 and then arranged for them to be released to embarrass their targets. 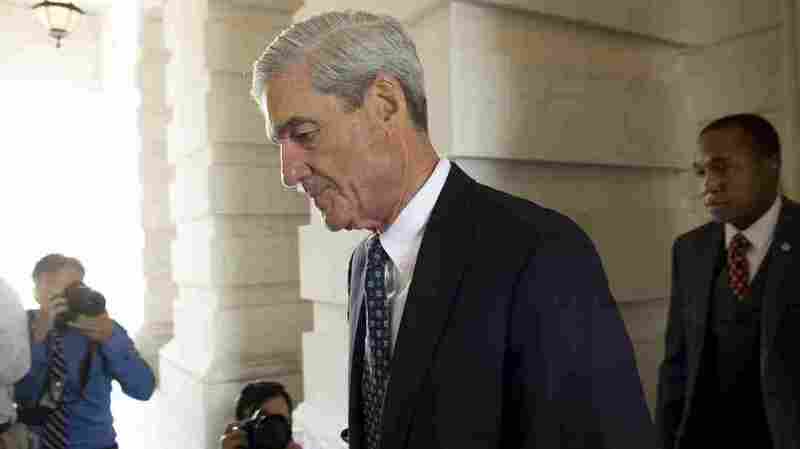 If, however, the investigation results in a book-length "Mueller Report," as there have been major reports by past congressional committees or special prosecutors, it could eventually find its way into the light of day. At the very least, Mueller finally might tell the full story of the Russian attack on the 2016 presidential election, about which many questions remain. If Mueller has found no wrongdoing by the president, he also could clear Trump and the nation could move on. Or if Mueller discovers wrongdoing, he could put the onus for action on Congress or voters; it would be up to the democratic process to deal with Trump if Mueller argued the president had transgressed somehow. The Justice Department might also signal whether it planned to file charges against Trump once he no longer was president — either because he had been removed by Congress, voters or his term limit — given the orthodox view within DOJ that it cannot indict a sitting president. If the president won't agree to an interview that Mueller felt would address his questions, Mueller's office could obtain a subpoena from a grand jury. That would seek to compel Trump to sit for the interview, but no one knows what might happen next. In the case of President Bill Clinton, the White House responded to a subpoena by negotiating an interview in the White House with independent counsel Ken Starr. Clinton agreed to appear before the grand jury via closed-circuit TV, rather than having to physically go to a federal courthouse. Starr withdrew the subpoena. So although presidents have done interviews with high-level investigators in the past, the legal assertions that Trump's lawyers have made about his powers and privileges have never actually been tested in a court battle in modern times. Could Trump invoke his Fifth Amendment right not to give evidence that might incriminate him? Of course. But there are political implications — in the past, Trump has criticized taking the Fifth as a de facto admission of guilt. Could Trump try to fight a subpoena? Yes. If Trump's attorneys were determined to fight, they could ask a federal judge to throw out the subpoena. They could make arguments like the ones they reportedly made in their letter to Mueller's office: that, first, the Constitution confers on the president unique powers and responsibilities that protect him from a subpoena and, second, that the special counsel's office has already received all the information it would get from Trump in other ways. That puts the ball in Mueller's court. Giuliani said on Sunday that although the door isn't completely closed to an interview, he and Trump are strongly leaning against one — as has been the case for weeks. No matter what happens, no meeting between Trump and Mueller's team would take place until after Trump's planned summit in Singapore on June 12, Giuliani said. How long might a legal battle take? There's no telling — even if the Supreme Court agreed to hear arguments about the matter on an expedited basis given the importance of the case. The high court would stand at a crossroads of its own: If it recognized Trump's assertion that the president can reject a subpoena, it would be a historic vindication and add yet more power to an office that has been gaining in its reach since President Franklin Roosevelt. If the Supreme Court ordered Trump to appear before a grand jury — either in person or in a Clinton-like arrangement via video — that would be a historic move all on its own. That could take months or years, but the relevant decisions by Trump, his lawyers, Mueller and his office could take place within the next few weeks.